Two Ohio elected officials offer agendas that differ by wide margins. But which one is right? The only thing “right” about Republican state Treasurer Josh Mandel’s rubber-match vendetta campaign against twice-elected Democratic Senator Sherrod Brown, is the state treasurer’s crusade to oppose sanctuary cities. Mandel’s “alt-right” horror movie campaign appears scripted to replay Donald Trump’s national magic trick that won big in center-right Ohio in two years. With luck, ISIS will not have established a beachhead somewhere on the long shorelines of Lake Erie or the Ohio River by mid-term election time. Requiring Medicare to cover the costs of hospitalization, specifically when it’s labeled “observational status,” is the purpose behind Sen. Brown’s bill. It addresses a practical problem of personal health that everyone can get on-board with, for obvious reasons, that it could happen to them before sundown today. Establish a 90-day appeal period following passage for those that have a qualifying hospital stay and have been denied skilled nursing care after January 1, 2017. Asked whether the president’s new budget director, Nick Mulvaney, and the new head of the Congressional Budget Office, Keith Hall, a Republican who was appointed by congressional Republicans, can be trusted to present real numbers, Sen. Brown said he hopes they can. While he noted that Mr. Mulvaney developed a reputation in the House as a cut-the-budget-at-all-costs lawmakers, he hopes he can play referee. The senator responded to a question about why the “public option” never made it to the discussion table in 2011, when the ACA was passed, and why the call last year by Vermont Sen. Bernie Sanders for a “Medicare for all” system likewise didn’t make it into the public discussion, Mr. Brown said it’s a political impossibility with Donald Trump in the White House and Congressional leaders like Majority Leader Mitch McConnell in the Senate and House Speaker Paul Ryan having no interest in exploring it, even though many says it’s the real answer to America’s deplorable health care system. Gearing up for his looming contest in two years to defend his senate seat, Mr. Brown, now calling himself the “Hunted Democrat,” is casting his political fortunes with real people with real needs. Health care, to no ones surprise, is at the top of his list along with creating good jobs for Ohioans who need one. With unemployment up again in all 88 Ohio counties, Sen. Brown has a rich field to mine as he broadcasts his call for improving the lives of workers across the board, with higher wages, more involvement at work, better benefits, including affordable health care. The man from Mansfield in Richland county spoke to reporters Wednesday, following the release by House Republicans of their Trumpcare plan—The American Health Care Act—that would replace the Affordable Care Act, aka Obamacare. While “Boots” Mandel is off fighting fanciful war against far away foes running wild through Ohio, Sen. Brown is aiming his legislative arsenal on practical policy by changing current Medicare policy to deliver a real service to people who need skilled nursing care at a critical time in their life. To receive that attention, a patient today must have an “inpatient” hospital stay of at least three days in order for Medicare to cover post-hospitalization skilled nursing care, which often includes necessary physical therapy and round-the-clock care. Patients that receive hospital care on “observation status” do not qualify for this benefit, even if their hospital stay lasts longer than three days. Sen. Brown’s bipartisan legislation, the Improving Access to Medicare Coverage Act, which has three co-sponsors—Democrat Bill Nelson of Florida, Republicans Susan Collins of Maine and Shelley Moore Capito of West Virginia—would allow for the time patients spend in the hospital under “observation status” to count toward the requisite three-day hospital stay for coverage of skilled nursing care. That’s the kind of good government only good government politicians who believe government can deliver can deliver, an ideological line that separates Mandel’s agenda based on fear from Sen. Brown’s agenda based on positive, populist thinking. As a former Marine who prominently features his combat boots in his political campaigns, Mr. Mandel has earned the nickname “Boots.” Boots wants to go to war against Sen. Brown again after losing badly to him in 2012, but this time his opening move, sent in a recent email blast aimed at Ohio voters who went with Trump over Hillary Clinton, is all about sanctuary cities. “I oppose sanctuary cities! They make our cities less safe and cause more problems for law enforcement. We must stop sanctuary cities. We cannot allow our big cities like Cincinnati and Columbus to put the safety and security of its people at risk,” Mr. Boots said. Josh Mandel believes sanctuary cities “enable our enemies and don’t deter them,” so it follows his number one priority lies in safeguarding families from radical Islamic terrorists. “I fully support efforts to hold elected officials who oppose the ban accountable by making them liable for crimes committed by undocumented immigrants,” Mr. Boots tells his Trumpster fan base. Sherrod Brown wants everyone to be with him because his course is set over the next two years to deliver for regular people need to stay regular. 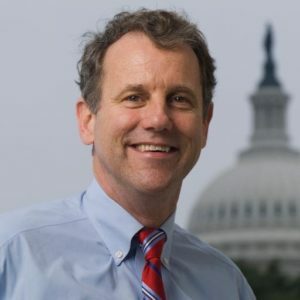 Sherrod Brown delivers real services with real impacts, not scary Hollywood scripts crafted around world-ending scenarios that include radical Islamic terrorists moving in next door, then running rampant throughout the Buckeye State. Speaking on the Senate floor following his gaggle with reporters, Sen. Brown wanted the Senate to note that 200,000 Ohioans are now under treatment for opioid addiction, because they have insurance treatment courtesy of the ACA. He has a couple problems with Trumpcare as proposed by House Republicans, starting with unknown costs that will explode the deficit because the Congressional Budget Office has not yet “scored” the blueprint for replacement. What the senator does know, is that tens of thousands of those 200,000 will loose their treatment under Trumpcare as introduced. “How morally repugnant is this,” Sen. Brown told his colleagues today. What irks him most is that House and Senate Members enjoy taxpayer funded health insurance are all too ready to “take insurance away form millions of people, who have jobs but are paid low wages.” Brown says improvements to the ACA are needed, but he’s against wholesale destruction. “This bill coming out of the house is far from an adequate replacement,” he said. More than 30 organizations have endorsed Sen. Brown’s bill, including: AARP, Alliance for Retired Americans, American Case Management Association, American Health Care Association, AMDA – The Society for Post-Acute and Long-Term Care Medicine, Center for Medicare Advocacy, LeadingAge, National Association of Elder Law Attorneys, National Association of State Long-Term Care Ombudsman Programs, National Center for Assisted Living, National Committee to Preserve Social Security and Medicare, National Consumer Voice for Quality Long-Term Care, and the Society of Hospital Medicine.